Quartz has become a big trend in new counter designs over the last couple of years, and it’s easy to see why people find it attractive. Natural quartz looks great, and it also provides you with unique forms of protection you can’t get in one single surface if you opt for any other choice. Granite is also popular, but there are issues with it that cause many to reconsider. Solid surfaces like ceramic and resin are durable, but they have a hard time presenting with the elegance of stone, and they also have other performance issues quartz does not share. If you’re shopping for durability so you preserve the appearance of your counters, then quartz offers the most robust balance of protections. 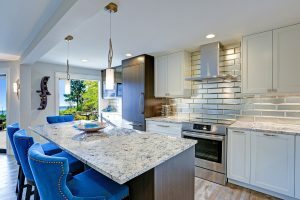 If you do decide you want to do your new countertops in quartz, remember that stone counters are quite heavy, and they often require multiple people and special tools to install. It’s a good idea to get quotes before opting for a big DIY project that might require skills you have not practiced. Not only does professional installation save you time and effort, but it also protects you, because professional installers guarantee their work. They also carry insurance, so if there is any mishap that damages your property during the installation process, they have risk protection you do not. When you consider things that way, it’s well worth the investment to have a professional ensure your new natural quartz counters look great for years to come.